One of the strengths of UDT is our ability to scale-up processes to demonstration level. This is accomplished in several pilot plants, whose details and characteristics vary according to the requirements of ongoing projects. The main plants are described below. Brand and model: UDT- owned and manufactured. 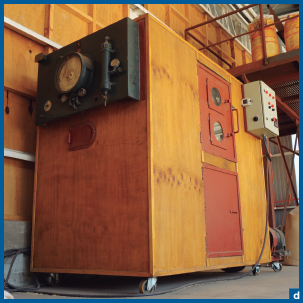 A) Autoclave for wood impregnation. The maximum working pressure is 14 bar. Superheated vapor temperature: 300-500 °C. Maximum flow of superheated vapor: 200 – 300 kg/h. Working pressure: 0 – 1 bar. Chamber dimension: 650 mm x 650 mm x 6500 mm. Chamber material: Carbon steel ASTM A-42. Description: It has a chamber of 4,22 m³ and 2,55 m³, in which the wood to be treated is located. The heating is direct, either with vapor or oils/waxes. D) Tube and shell exchanger. F) 16 measuring devices (thermometers, compound gauges and pressure gauges). G) 20 valves (for purge lines and supersaturated, superheated and recirculation vapor lines). 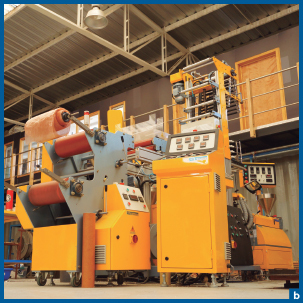 A) Three splicers for the manufacture of MDF boards, particles and OSB. D) Saw to format boards. Furthermore, it has an air-conditioned room for the storage of test tubes, before the quality control of boards. Brand and model: Sprout-Bauer type, H. Thalhammer K.G. manufacturer, Austria. C) Area of digestion and incorporation of reagents. (A) to (D) parts are used to produce type TMP or CTMP fibers and (A) to (H) parts constitute the necessary equipment to produce stuck fibers for MDF boards. The refiner has 14 inches in diameter and the maximum pressure in the digester is 12 bar. Capacity: 100 kg/hr (thermoplastic compounds). 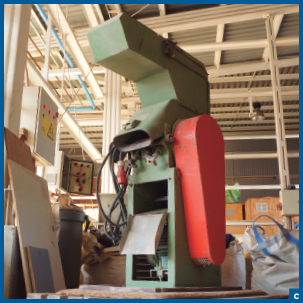 Description: The plant can produce composite materials in the form of pellets or profiles and is composed of three equipment connected in series: A rotary dryer, a twin-screw extruder and a pelletizer with pneumatic cooling (manufacturer: Erema). 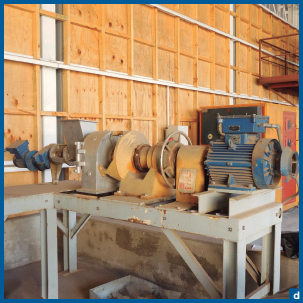 The rotary dryer is connected to the feeding of the extruder and allows drying the material before it enters to the extrusion stage. The twin-screw extruder is 45 mm in diameter, with an L/D ratio of 40 and has two gravimetric feeders (Brabender brand). It can produce different types of composite materials (wood-plastic, reinforced plastics, masterbatches and nanomaterials, among others). It has different molds. 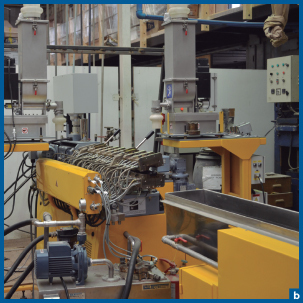 b) Brand and model: Labtech Engineering Co. LTE26 Extruder. Capacity: 30 kg/h (thermoplastic compounds). Description: This extruder has the capacity of producing thermoplastic composite materials in the form of pellets. This twin-screw and co-rotary extruder is 26 mm in diameter of screws with an L/D ratio of 40. 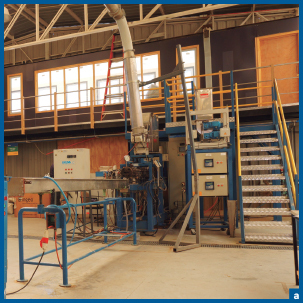 It has two gravimetric feeders, which allows it to produce biodegradable, nanomaterial and wood-plastic material compounds. 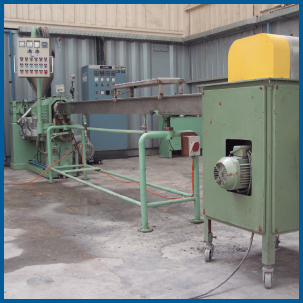 Description: The plant can process different types of synthetic thermoplastic polymers (PP, PE, PS, PET, etc.) or biopolymers (PLA, PHB, etc.). Through a proper head to the exit of the extruder, it is possible to obtain different types of profiles. Similarly, it is possible to obtain pellets using a pelletizer for that purpose (Primotécnica brand) and a cooling water bath. Brand and model: Arburg, 420 C Model. Capacity: 100 ton closing force, 190 grams of plasticizing capacity. Description: The injector is composed of two units: injection and closing. The injection unit is part of the machine that conducts the feeding of plastic material pellets, plasticizing and mold injection. The main elements are the screw, a feeding hopper, a motor and heaters. 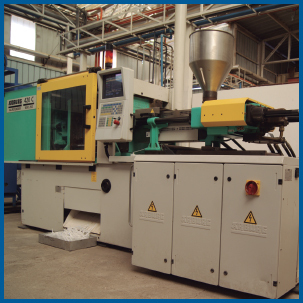 The closing unit is the component of the machine that holds the mold, conducts the closing/opening and ejects the molded part. 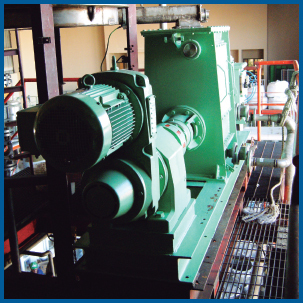 The main component is the closing hydraulic system, which is piston type. It has molds to manufacture test tubes to determine mechanical properties (ASTM 790, 256 and 638 standards) and the fluidity of plastics (spiral mold). Capacity: 20kg/h, plates according to head of 20 cm wide and a thickness ranging between 25-45 microns. Description: Single screw blowing extruder used to produce synthetic (polyethylene, polypropylene) and biodegradable (polylactic acid, PLA and polybutylene adipate-co-terephthalate, PBAT) plastic films. Brand and model: Labtech Engineering Co. LF-400. Capacity: 12 kg/h, plates according to head of 30 cm wide and a thickness ranging between 25-45 microns.. Description: Three-layer blowing extruder with 3 extruders of 20 mm in diameter of screw and at a L7D ratio of 30. 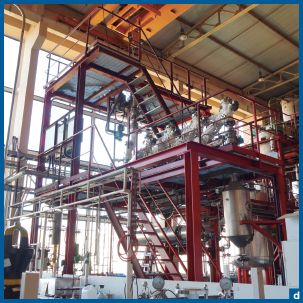 This plant allows producing multilayer films from different thermoplastic materials such as polyethylenes, polypropylenes and biodegradable plastics (polylactic acid, PLA and polybutylene adipate-co-terephthalate, PBAT). Description: Comminution of brittle solid samples (e.g. 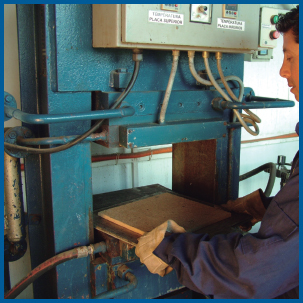 bark), through the impact produced between rotating hammers and the material to be treated. 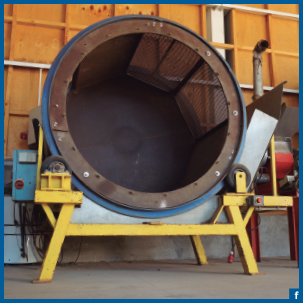 The type of sieve to be installed at the bottom of the mill defines the maximum granulometry of the product. Description: The material to be milled is fed through a high-speed rotating cylindrical element, in which numerous needles that impact the material are attached. Description: Mill to grind thermoplastic materials, through cutting knives. Description: The refiner has two parallel discs, one of which rotates at 1.200 rpm. The material is fed through the center of the disks and requires to move forward obliquely between disks. Description: Low speed rotary grinder, typically suitable for grinding plastic bags, maxibags, plastic bottles, etc. It has two motors of 7.5 kW. Description: Hexagonal rotating drums of 150 cm in diameter and 110 cm long. Each side of the hexagon is supplied with a sieve of particular size and shape. 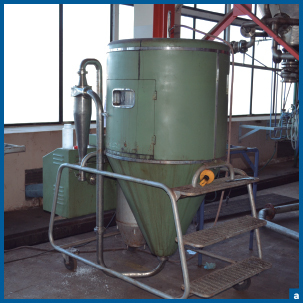 Capacity: 10 m3/h, depending on the granulometry of the product. 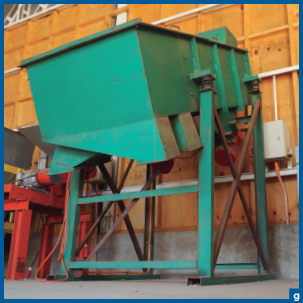 Description: Vibrating sifter with three levels of separation, approximately 2.5 m long, 2.7 m high and 1 m wide. It has two vibration motors, which deliver the energy required for the selection of particles; material loading is done manually. Temperature range: 0 to 180 °C. Operating Pressure: -1 to 1 bar. Description: Stainless steel equipment, whose solids container to be extracted has a volume of 30 L. It includes an evaporator. A) Thermostat with an agitator of 38-liter capacity. B) Condensation and storage column. C) Reactors of 30-liter capacity. A) Extractor of 800 liters (maximum pressure 12 bar). B) Recirculation pump (Rheinhütte, titanium, motor 3 kW). C) Heat exchanger (Schiller of Hastelloy C4, 6 m² of exchange surface). D) 6 storage tanks (1 m³, atmospheric pressure). A) Extractor of 4000 liters (maximum pressure 6 bar). B) Recirculation pump (KSB, stainless steel 316, motor 1,5 kW, flow 12m3). 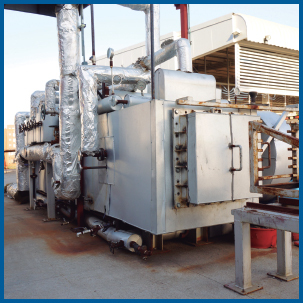 C) Heat exchanger (Own manufacture, stainless steel 304L, 7,96 m² of exchange surface). D) Pressurized storage tank (2,3 m³, maximum pressure 6 bar). Extractor capacity: Between 1-5 kg/h. B) Solids feed tank to the pressure zone. C) 4 oblique extracts with transport augers. D) Solids discharge system from the pressure zone. E) Tank and pump for extraction liquid circulation. Brand and model: ARTUR PROBST. Capacity: Equivalent to 60-70 L of water/h. Description: The evaporator is made of stainless steel (DIN 1.4571) and has a direct condensation system, consisting of a packed column for the condensation of vapors, a condensate recirculation, two heat exchangers of pipes and plates connected in series, and an accumulation tank of 100 L. Exchange surface of 5 m². Capacity: Equivalent to 20-25 L of water/h. Description: The evaporator is made of stainless steel (DIN 1.4571) and has an indirect condensation system, consisting of two heat exchangers of welded pipes and plates, connected in series, and an accumulation tank of 600 L. Exchange surface of 1,5 m². Description: The evaporator is made of stainless steel (DIN 1.4571), and has an indirect condensation system, consisting of two heat exchangers of welded pipes and plates, connected in series, and an accumulation tank of 600 L. Exchange surface of 1,5 m². Brand and model: EBERHARD BAUER. Capacity: 100 L of water/h. Description: The evaporation plant has a stainless steel metal container AISI 304, heated by a vapor jacket working with pressures up to 5 bar, with a storage capacity of 30 L, stirred by a drive system mounted on top with stainless steel blades and a 1.8 kW output gearmotor and 60 rpm rotation with 23.5:1 gear ratio. 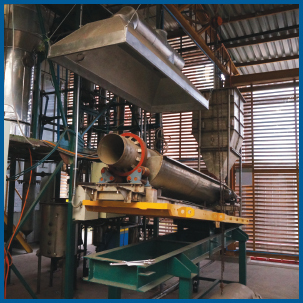 The plant also has a vertical stainless steel tube exchanger AISI 304, with a transfer area of 2.5 m². The vapor is drawn under vacuum by an autonomous vacuum unit with an output of 1.5 kW, SIEMEN & HINSCH m.b.H (SIHI) brand, L0 2704 KK model. Brand and model: GPBR. HERRMANN KOLN-EHREFELD. Capacity: 50 L of solution to be evaporated. 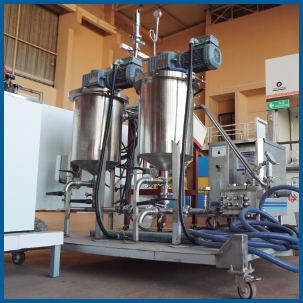 Description: The evaporation plant has a stainless steel metal container AISI 304, heated by a vapor jacket working with pressures up to 4 bar, with a storage capacity of 30 L, stirred by a drive system mounted on top with stainless steel blades and a 1,4 kW output gearmotor and 50 rpm rotation with 28:1gear ratio. 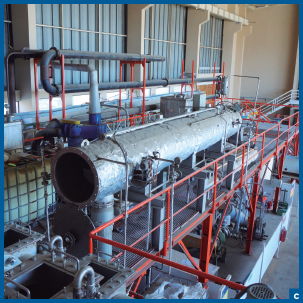 The evaporator has a condensation system consisting of two plate evaporators connected in series, and a shell and tube exchanger arranged horizontally, with transfer areas of 1.44, 1.54 and 1.02 m, respectively, in order to condense the vapor drawn by the vacuum. Brand and model: Büttner – Schilde – Hass AG. 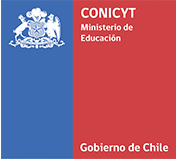 Capacity: (0 – 7) L/h. Description: The solution to be evaporated is injected in small drops at the top of the dryer through a centrifugal nozzle, powered by pressurized air. The solution flow may vary within a certain range. Moreover, the drying air is heated by four electrical resistors and introduced into the dryer together with the solution. During a very short period, the small particles of the solution dispersed in the drying air move into the conical bottom of the dryer and then transported to a cyclone, where the vapor and solid particles are separated. Brand and model: Industriewerke Karlsruhe, Model: C 80A-00.00. Capacity: 0 – 50 L/h. 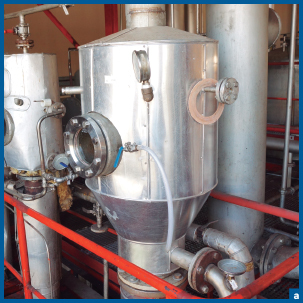 Description: The solution to be dried is injected through a sprayer at the top of the dryer, powered by a dosing pump. The solution flow may vary according to the requirements of the process. The sprayed solution is dried by direct contact with hot air, which receives energy intake by means of electrical resistances. 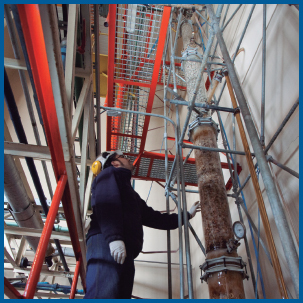 Finally, the separation of the dried material is performed by the action of a cyclone filter. Capacity: Depends on the solution to be dried. Description: The dryer consists of a Teflon treadmill of a 495 cm long and 43 cm wide, mounted horizontally inside a stainless steel cylinder, which is kept under vacuum. The treadmill moves on 5 flat heat exchangers, which can be fed with vapor, a thermal fluid or cooling water. The solution to be dried (which must have a viscosity of approximately 1000 centipoises) is fed in one end of the dryer, so that their distribution is uniform across the width of the treadmill. The treadmill moves continuously at a rate of 5 – 25 cm/min, in terms of which the solution comes successively into contact with the surface of 5 heat exchangers, which are maintained at specified temperatures. The energy transferred from the surface of the exchanger to the solution through the Teflon tape, causing a gradual evaporation of the solvent. 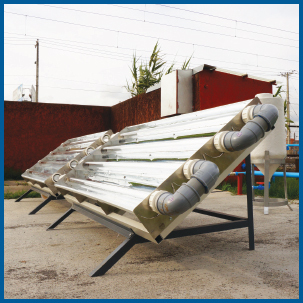 If the material to be dried has plastic characteristics, usually the last exchanger is used as a cooler. At the end of the dryer, a mechanical device scrapes off the solid of the treadmill and is evacuated to a container. Capacity: Evaporation rate of 5 kg/h of water. Description: It has 5 trays, where the wet product is deposited, and receives energy intake directly through hot air, which is recirculated by an axial fan disposed within the drying chamber. An electrical resistance of 2 kW, which has a temperature control system, accomplishes the energy input. The dimensions of the drying chamber are 2m long, 1.3m wide and 2m high. Brand and model: QVF Manufacturer. Made of glass, modular type. Capacity: Depends on the separation function that must be met. Description: The distillation column is packed and has 18 theoretical plates. It is made entirely of glass, with the only exception of the reboiler, whose construction material is graphite. The total length of the column is 9 m, the stripping section has a diameter of 25 cm, which decreases to 15 cm in the enriching section. Description: The extrusion press is made of stainless steel (DIN 1.4571); its compression ratio is 1/5 and if it is part of a closed process is hermetic. The drive motor is 6.8 kW. Brand and model: Alfa Laval-LabStakM20. Description: The system is equipped with a high-pressure pump, 7.5-liter tank, heat exchanger, valves, gauges, and a manual hydraulic pump. Its design allows to use flat or spiral membranes for reverse osmosis, nanofiltration, ultrafiltration and microfiltration processes. 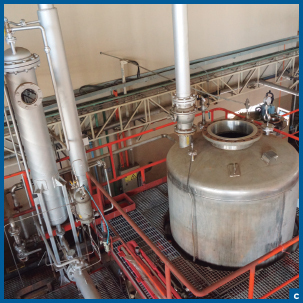 The sample to be filtered is deposited in the tank and driven by a centrifugal pump. 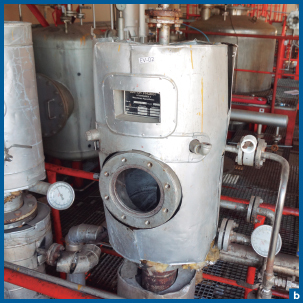 The sample temperature is regulated by a heat exchanger of the shell and tube, using water as coolant. 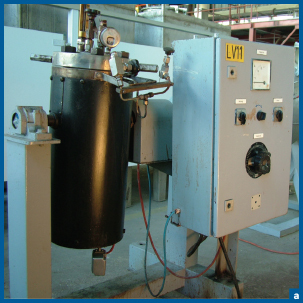 The permeate or filtered fluid can be returned to the feed tank, to operate the equipment in recirculation mode, or be fed into a new vessel to operate in concentration mode. Brand and model: SIMES Homogenizer HMG-SAN-2-2M model and several additional components. Capacity: 80 L/h nominal (water). A) SIMES HMG-SAN-2-2m 3-piston double acting homogenizer, capable of operating up to 600 bar pressure, with a nominal flow of 80 L/h. B) Two hermetic 304 sanitary stainless steel storage tanks with capacity of 50 L.
C) Two SEW explosion-proof gearmotors of 75 Hz and 0.75 kW. E) a remote control panel. 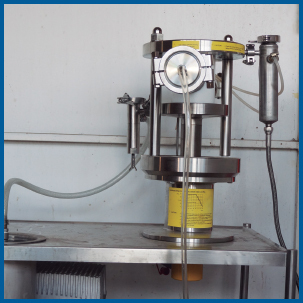 The system allows homogenizing liquid-liquid mixtures and suspensions of low consistency solid. 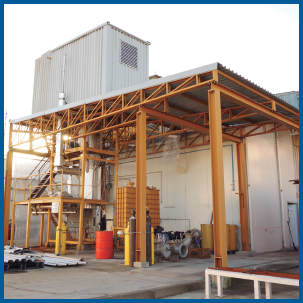 The plant can operate with various solvents, including explosive atmospheres. Description: Rotating reactor, equipped with electric heaters, pressure gauge, thermometer and sampler. Capacity: 4 L of total volume. Description: Vitrified reactor of 40 bar, equipped with a vapor heating jacket (max. 16 bar), pressure gauge, thermometer and sampler. Description: Pressurized vitrified reactor (max. 6 bar), equipped with a vapor heating jacket (max. 6 bar), agitation (motor 3 kW), pressure gauge and thermometer. Description: Pressurized vitrified reactor (max. 6 bar), equipped with a vapor heating jacket (max. 6 bar), mechanical agitation, pressure gauge and thermometer. Capacity: 3.000 L of total volume. Description: Pressurized (max. 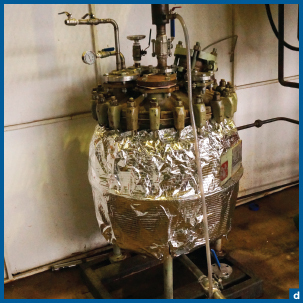 6 bar) stainless steel reactor (DIN 1.4571), equipped with a vapor heating jacket (max. 6 bar), Scuba agitator (motor 4 kW), pressure gauge and thermometer. Brand and model: Shott & Gen Mainz, Jena Glas. Capacity: 50 and 20 liters. Description: It consists of 2 reactors with mechanical agitation of 20 L and 50 L and heating cloaks. It also has two glass balls, each with 20 L capacity. A) Work volume: 20 – 100 L.
It also has temperature, pH, foam, pre-inoculation (inoculum incubation), strain preservation and strain manipulation (biosafety hood, heater), control systems and a culture medium preparation system (magnetic and mechanical agitator). Brand and model: Manufactured in UMAINE, USA. 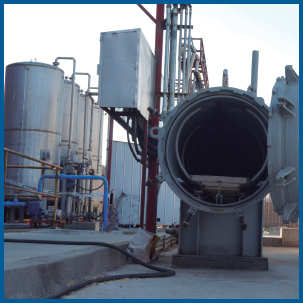 Description: It is a biomass flash pyrolysis plant that has a fluidized bed reactor and is heated by tube furnace. The gas cleaning train consists of a hot filter. The condensing system is composed of a stainless steel condenser, followed by an electrostatic precipitator. 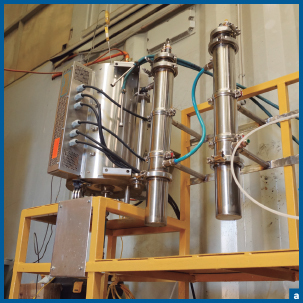 The feeding system consists of a closed hopper and a dosing screw that feeds a device where it is pneumatically driven into the reactor, using nitrogen as carrier gas. Capacity: Approx. 500 g of polymer/trial. A) Furnace (maximum operating temperature: 1100 °C). 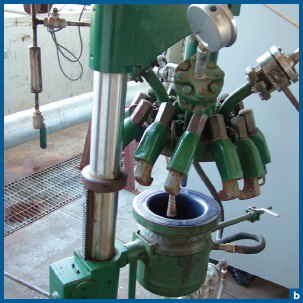 B) Pyrolyzer(operating temperature: 400-600 °C). 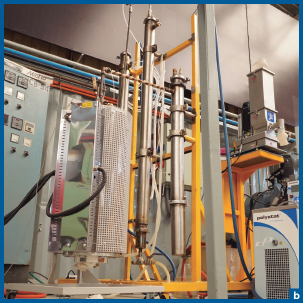 C) Condensation system consisting of an indirect contact condenser and water trap system, aimed at the collection of solid and liquid products obtained from the pyrolysis process. Capacity: 20 kg/h of biomass. 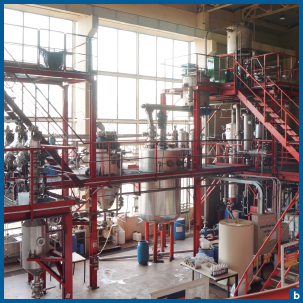 Description: The fast pyrolysis plant uses own technology developed by the Technological Development Unit. It consists of a system of three fluidized bed reactors in series: charcoal combustion lower reactor, fast pyrolysis intermediate and higher preheating, which are connected to each other by a pneumatic system that allows recirculation of the particulate material comprising the beds; In addition to a hot vapor filtration system, a rapid cooling equipment for organic vapors and an electrostatic filter. 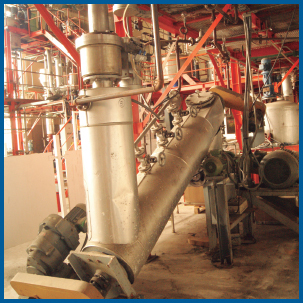 The plant has a maximum processing capacity of 20 kg/h of biomass, with a pyrolytic liquid yield of 70% on a dry basis. 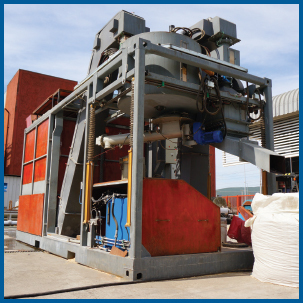 Description: The torrefaction pilot plant is based on a three-stage reactor of countercurrent solid-gas direct contact. The energy required for the process is provided by vapor in contact with biomass, which is overheated in a tubular heat exchanger, through electrical resistances. 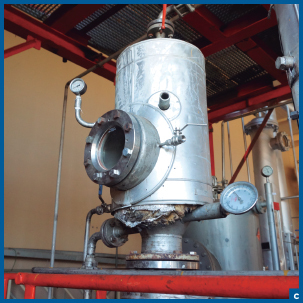 Torrefaction gases are condensed at the exit of the reactor in a tube and casing heat exchanger using cooling water. 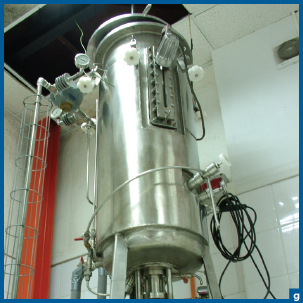 Description: Bubbling fluidized bed reactor designed by UDT. 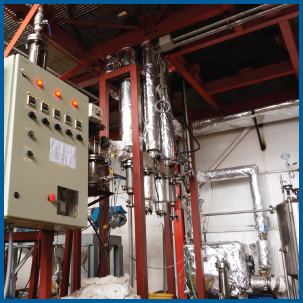 The plant has a system for online measurement of combustion gases and a system for particulate matter measurement according to EPA 5 Standard. 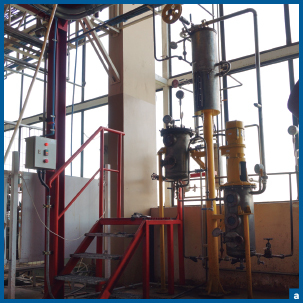 The co-combustion plant has a capacity to supply 50 kg/h of coal, 10 kg/h of limestone and 20 kg/h of biomass. 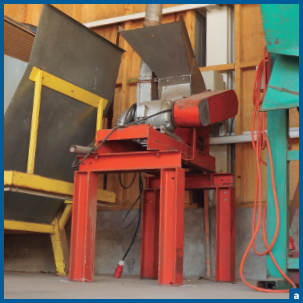 For purposes of raw material preparation, it has a hammer mill for mineral coal. Description: Comminution of mineral coal through the impact produced between rotating hammers and the material to be treated. It requires a feeding particle size of 2” with less than 10% moisture. 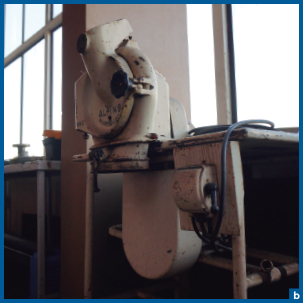 Brand and model: Mixer-Settler UDT. Capacity: 2 x 150 LPH. 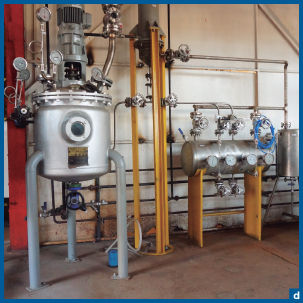 Description: The liquid-liquid extraction pilot plant has 3 units of agitators and variable volume decanters allowing the solvent extraction in countercurrent flow, followed by an evaporation unit for recovering and recycling the solvent used. 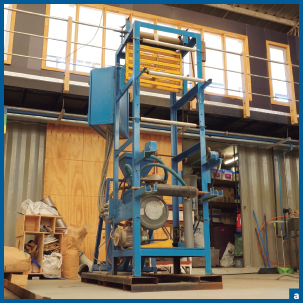 Capacity: 200 – 400 kg / hour. Description: The plant, built in a 20-feet container, is divided into two parts: the loading hopper and the pressing area. 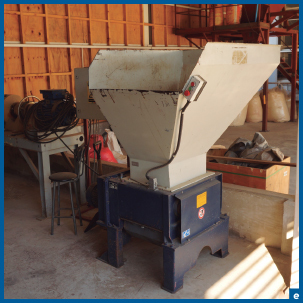 The hopper, with a capacity of 7m3, has a moving floor pushing the biomass onto the conveyor belt, carrying the material to a buffer tank where it is temporarily stored, feeding the dosing screw of the pelletizing press. The press, Kahl brand, has horizontal discs, model 33-390 cpl. Pellets pass through a vibrating screen, to remove fine particles, then they are conducted to a cooler, where they remain for about 4 minutes, and finally they are evacuated and packaged. Capacity: 5 kg / hour. Description: The plastic pyrolysis plant is composed of a stirred reactor equipped with an anchor-type stirrer and built entirely in AISI 316L steel. The energy required for the reaction is given by electrical resistors with a power of 1.7 kW. 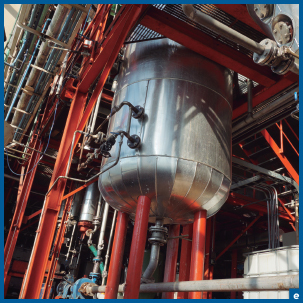 The feed to the reactor is carried out in a molten form by an extruder, which is heated, in turn, by electrical resistors. 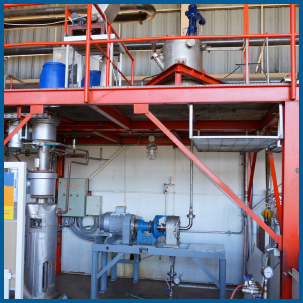 Gasified products may vary depending on the operating conditions used and they are produced from liquid (pyrolytic oils) to solid (pyrolytic waxes) hydrocarbons at room temperature with a higher or lower gas content, respectively. These products are condensed in double layer exchangers equipped with interior baffles to improve the heat exchange in the condenser. The plant operates under vacuum conditions, which is produced by means of a Venturi ejector, through which a liquid hydrocarbon circulates providing pressure levels around 50 mbar, depending on the temperature level of the fluid. 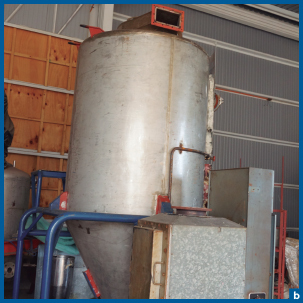 Description: The intermediate pyrolysis pilot plant consists of an inert atmosphere rotary kiln, built in Nigrofer 3220H ASTM B steel. 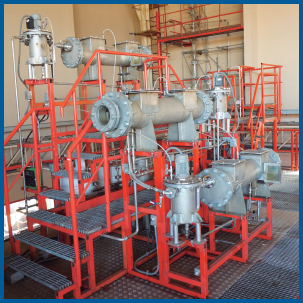 The energy required for the pyrolysis reaction is supplied by ten liquefied gas burners. 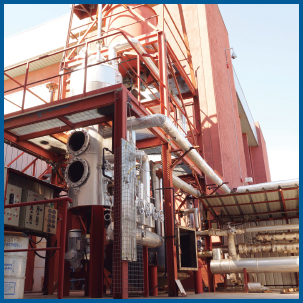 The carbon generated in the process is deposited in containers at the kiln outlet and the gases are conducted to a hot sintered metal filter (20 microns) to separate the particulate material; then, they pass through heat exchangers, where they partially condense and the bio-oil is recovered. The uncondensables are burned in a torch. 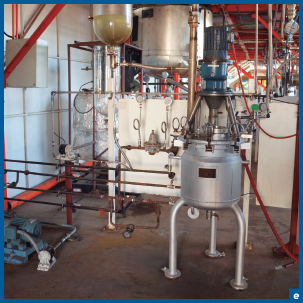 Brand and model: Own manufacture focused on the disc refiner Andritz, model 12-1C. 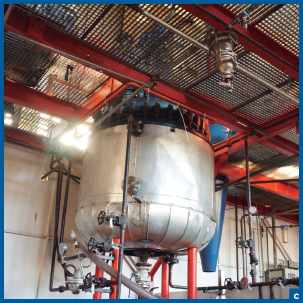 Description: The CMF production pilot plant is composed of an Andritz disc refiner with a 12-inch disc size. The raw material is loaded into a stainless steel container with a maximum capacity of 500 L, which is fed to the refiner through an open vane centrifugal pump. The cellulose-water solution is recirculated by the plant a certain number of times, until the desired viscous product (known as CMF) is obtained. Capacity: 250 to 2500 L /h per square meter of photo-reactor. 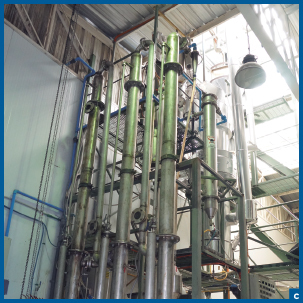 Description: This pilot plant is composed of photoreactors connected to a water tank and a diaphragm pump with anodized aluminum panels and borosilicate tubes through which the water and photoactive materials circulate. 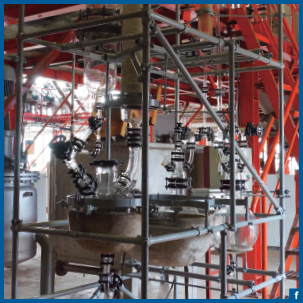 One of the photoreactors is used to carry out the oxidation of emerging contaminating molecules and pathogenic microorganisms, generating ultra pure water and CO2. The other is designed to reduce toxic metals (e.g., arsenic, chromium, cadmium, mercury), where precious metals (e.g., gold, platinum, silver) can be recovered. Both photoreactors use two different types of titanium-biochar composites, produced at UDT, to perform the desized oxidation or reduction reactions.